The Hurricane RS shares Carlton’s patented turret bearing design with the Hurricane TRX giving it 360-degree continuous rotation and massive cutting dimensions. 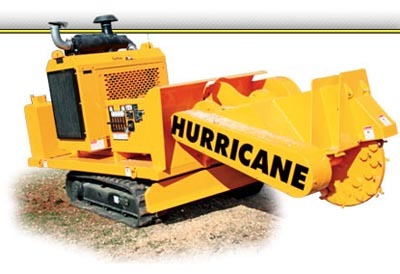 The Hurricane RS is capable of cutting a full 18-foot width, 53 inches high and over 2 feet deep. A Caterpillar track system is utilized on the Hurricane RS. This proven Caterpillar track undercarriage minimizes ground pressure and provides plenty of both climbing power and speed with its two-speed design. The rubber tracks used on the Hurricane RS are designed to help minimize turf damage. The proportional wireless remote control, included as standard on every Hurricane RS, gives the operator precise control from up to 1,500 feet. This powerful remote allows the operator to control the machine from auxiliary equipment. This remote features feather touch controls that allow the operator to control the speed of every function right from his fingertips. This remote minimizes operator fatigue, maximizing operator efficiency over a long day. The Carlton Hurricane RS delivers high production capacity in a Residential Service machine. Information sourced from www.stumpcutters.com.